The house is located in the town square of La Pera, 1 km from the Gala-Dalí Castle of Púbol. It has 2 double bedrooms and a sofa bed which gives capacity for 6 people. You can enjoy the views from a 33-meter terrace with views of the church and its square and the adjoining woods. It is a town house built before the 17th century and renovated in 2018. It is 20 minutes from the beach (near the best beaches of the Costa Brava), Girona and La Bisbal. It is located in the area called Medieval Ampurdan where you can visit Púbol, Madremanya, Monells, Peratallada, Pals, Ullastret and many other interesting towns. It is fully furnished and has all kinds of appliances. You can enjoy the village atmosphere and the terrace for quiet dinners. The keys are Nuki, you need an Android or Apple smartphone with active bluetooth. If you are a lover of road or mountain biking routes, this is your place. It is close to unbeatable routes such as els Àngels or la Ganga and secondary roads without much traffic. Terrace on the top with incredible views. We loved our stay here- it felt like our own private castle in the Spanish countryside! 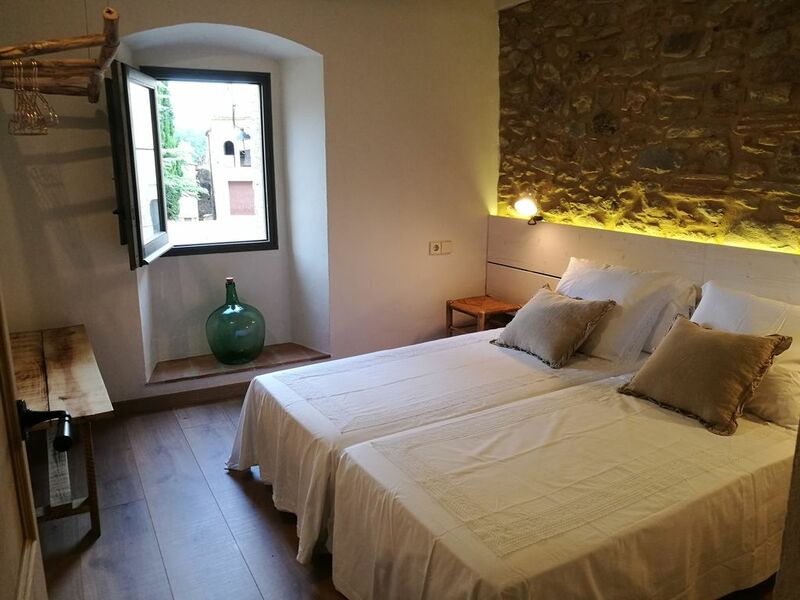 This is a completely renovated 11th century home updated for the 21st with all modern appliances, plumbing, electrical and even a whole-house pellet stove that overlooks the courtyard and mini-cathedral within the walled town. The meticulously maintained house has everything you need to stay including well-stocked kitchen for preparing meals. The three levels may be a challenge to anyone with mobility issues, but if you can handle that this is an incredibly unique and luxurious setting to explore Catalan. Our host made the entire process of staying in his family's historic home very satisfying. He met us on site for check-in and check-out at times that were convenient to us and shared local insights to help us explore the area as well as welcoming gifts that made our stay special. An unexpected highlight of our stay was the corner market that provided everything needed for simple meals including freshly baked croissants that we enjoyed each morning and baguettes and picnic supplies that were better than any found elsewhere in Europe. Bellissima casa ristrutturata da poco in maniera impeccabile. Proprietario molto cordiale e disponibile. Piccolo borgo affascinante, alla giusta distanza da quotidiane gite sull’intera Costa Brava (in un’ora si raggiunga Barcellona). Consigliatissimo! A good place for bike lovers, with mountain and road routes.